Paul with his brothers Mark and Stephen and parents Kathleen and James. Kilcar native, Paul O'Donnell, who was crowned National Sheepdog champion, was recently back in the village to show off his trophy. 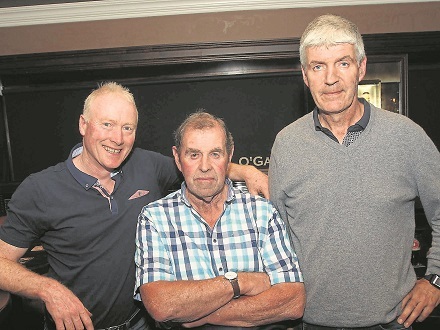 A night of celebration was held in O'Gara's to mark the occasion. Also there was another Kilcar man, William Gallagher, who has also qualified for the Irish team, who will take on the cream of Scotland, England and Wales in the Home Internationals in Co. Down on 6th, 7th and 8th of September. Speaking at the event, Paul, who is a garda based in Co. Wicklow, thanked everyone who helped him along the way, especially his uncle, Proinnsias, and father, Jimmy, who started it all off all those years ago. Paul and his dog Tim; William along with the entire Irish team are wished all the best in the International. See Thursday's Donegal Democrat (Aug. 30th) for more coverage from the night.